As part of an ongoing series of videos humorously depicting the “Surrey Jack” stereotype, Melvin Medici (Melvin Voon) released a video titled “Surrey Theme Song”. While the videos can be funny, Voon’s work has begun to create awareness about the dark side of the Surrey Jack lifestyle. 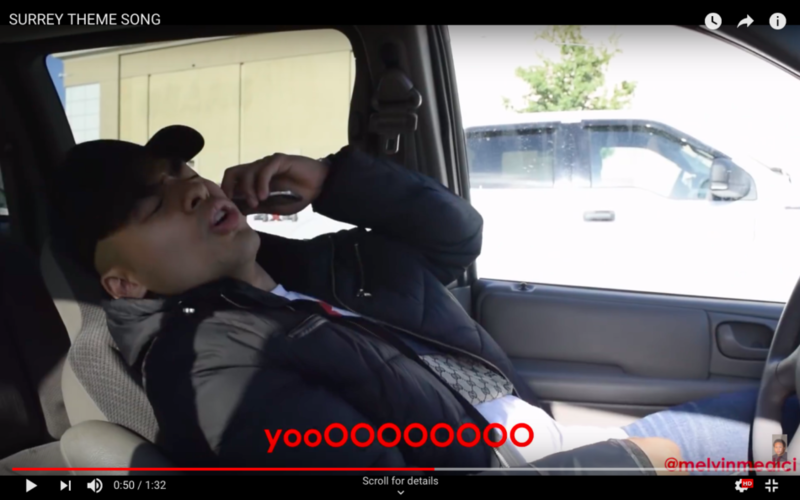 With over 76,000 views on YouTube, the video details common experiences in Surrey, such as driving along King George or Scott Road and hanging out at Guildford Town Centre. Many have commented on the accuracy of the song, as well as some of Voon’s other videos like “Types of Asian Guys – Vancouver”. Personally, I agree that the video is entertaining. It’s funny, authentic, and avoids being offensive or derogatory in its depiction of Surrey youth. I may not be a Surrey Jack myself, but I’ve known many people who bear a resemblance to Voon’s character in the song. However, the Surrey Jack stereotype also comes with traits not mentioned in Voon’s song. Young men and women referred to as Surrey Jacks are also often associated with being involved in drug dealing and gang violence. Multiple cases of young teenagers being stabbed or shot in the city made headlines in 2018, prompting an anti-gang rally and leaving Surrey citizens wondering if more children would lose their lives to gang violence. Surrey youth are vulnerable to violence, and a 2017 report by the Mayor’s Task Force on Gang Violence Prevention wrote that “some youth in B.C. join gangs because of a choice to pursue the gang lifestyle, instead of a necessity due to a lack of opportunities.” Being involved in these groups can create a sense of community and acknowledgement for youth, with recruiters convincing pre-teens to join through promise of reward for completing dangerous tasks. Considering this, Voon’s video isn’t problematic in itself, but it brings up the question of whether or not we should be taking the stereotype a little more seriously instead of just looking at it as a joke. Voon’s audience is mostly comprised of young people in Surrey, many of whom aren’t seeing the problems with drug dealing and gang activity from the inside. Glamourising and ridiculing this culture can be dangerous. Cracking jokes about Surrey Jacks takes away from the seriousness of the issue, meaning people are less likely to take the idea of changing things seriously. Kids thinking about joining the gangs don’t recognize the risks, and become much more likely to involve themselves in dangerous situations without realizing until it’s too late. By eliminating this stereotype, and the coverage of it in the media, we’ll be working to save young lives. Realizing how serious the situation is, and working together to prevent more young people from getting involved with the wrong groups, is essential to combating this growing problem.